THE PITTSBURGH STEELERS' PRACTICE had just ended on a temperate August evening, and children were everywhere. It was Family Day for the team, when the wives and kids of players and coaches visit training camp, play a little catch on the expansive green grass and stay for a barbecue. As thousands of fans headed down the hills of the Saint Vincent College campus in Latrobe, Pennsylvania, to the parking lots, one of their heroes sat in a far end zone, his two toddlers bouncing around him. 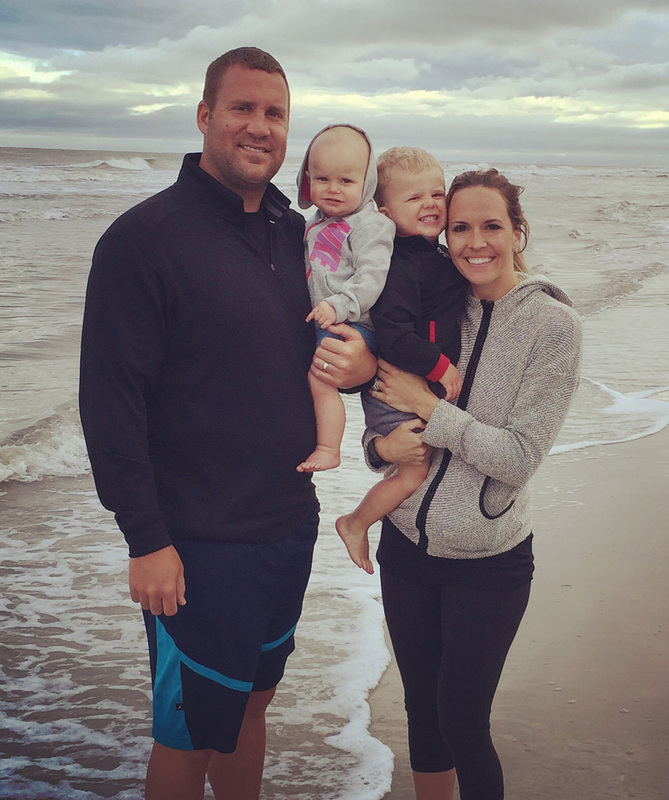 That bucolic scene didn't always have Ben Roethlisberger, his son and little girl at its center. And he wasn't always everyone's hero, either, even in Steelers-obsessed Pittsburgh. But five years after reaching a personal and professional nadir, when Big Ben -- the myth and the man -- was brought low by troubling sexual-assault allegations, Roethlisberger has crafted a successful and peaceful renaissance, formalized in a massive new contract agreed to this March. As he prepares this season to lead the best offense he's ever had, maybe the best offense in the NFL, Roethlisberger has also become something more: an unintended and reluctant example of a fruitful second chance, perhaps providing a roadmap even as the NFL and its fans grapple with how many more players deserve one. "I feel like I let down my family, my teammates, my coaches, the Rooneys, the whole family," Roethlisberger said one day, a few hours before another training-camp practice. "You feel disappointed, almost ashamed at times. Now that they have rewarded me with the [new contract], I want to reward them by winning football games. I want them to say, 'There is our guy.' I want to make them proud." THERE ARE SURELY SOME, even among the Steelers' most faithful fans, who will forever view Roethlisberger through the prism of the behavior that led a district attorney to publicly tell Roethlisberger to grow up, even as the district attorney was explaining that he didn't have enough evidence to prosecute Roethlisberger for sexual assault. But Roethlisberger and his inner circle are not entirely comfortable with the narrative of second chance granted and fulfilled, either, despite the outcome. One of Roethlisberger's closest friends is his agent, Ryan Tollner, and Tollner bristles at the idea of Roethlisberger being lumped in with Ray Rice and Adrian Peterson and Greg Hardy, whose respective domestic violence incidents last year exposed an NFL that was ill-equipped to handle the issue. Roethlisberger was shrouded in suspicion about his behavior with women, but he was never charged with a crime, and Tollner calls the assault allegation investigated in a small town in Georgia "false." Tollner, in fact, compares Roethlisberger's situation more closely to Tom Brady's Deflategate saga, because Tollner believes Roethlisberger was suspended for four games at the start of the 2010 season (a reduction from the original six games) not because of evidence against him but because of the negative publicity the allegations brought to the league. That he was linked to such allegations still troubles Roethlisberger. But nobody, including him, denies that the experience was a transformative event in his life. It marked a line of demarcation between a wildly successful quarterback whose sometimes boorish behavior called his judgment into question and who had seemed removed even from his own teammates, and one who is now something of an elder statesman on a team that, more than ever, relies on his skills and steadiness. Like everyone else in the NFL, Roethlisberger watched the scandals of Rice, Peterson and Hardy engulf the league last season, but Roethlisberger did not think much about his own problems as he saw the others cast out of the game. Roethlisberger has been careful to avoid talking about the various transgressions of other players; if he spent any time at all pondering his own fate while the nation debated whether the NFL has a problem with women, he is not saying. "I think you can learn from things in your past," Roethlisberger said. "You learn when you throw an interception or lose a Super Bowl. It's the same thing in life with anything. We go through so many things as human beings. We are all far from perfect. We all have to deal with issues throughout life." Roethlisberger went through counseling during his suspension, and he spent hours talking about his behavior and sometimes apologizing for it. He is comfortable enough now to try to explain the sense of privilege that got him into trouble. "You get caught up when you get so much success so fast, especially in a place like this, where the Steelers are such a big deal," Roethlisberger said one morning during training camp. "It does go to your head a little bit. I can admit that. You get caught up in the persona -- Big Ben. It's not always a good thing. When you start believing that's who you are all the time, instead of just on the football field. ... It's OK to be that on the football field. I use the analogy, you have to be Clark Kent off the field. You have to be Ben Roethlisberger off the field. I think when that Big Ben starts to get off the field, that's when you run into issues of losing track of who you really are." Roethlisberger enjoyed immediate success after the Steelers made him the 11th overall pick in the 2004 NFL Draft. On a veteran-laden team driven by defense and the running game, Roethlisberger was able to seamlessly slip under center without shouldering the burden of lifting a rebuilding organization with his passing game. The Steelers went 15-1 his rookie year before losing to the Patriots in the AFC title match. The next season, they won the Super Bowl. Roethlisberger had helped persuade running back Jerome Bettis to return for that season by promising him a trip to the title game, an early glimmer of Roethlisberger's leadership abilities emerging. More telling about his football future was how the Steelers leaned more on Roethlisberger's arm during the playoff run. The Roethlis-burger sandwich and Big Ben Beef Jerky were all the rage as Roethlisberger's blue-collar playing style -- he was far from graceful, but tough and willing to take a hit -- appealed especially to Steelers fans steeped in the Steel Curtain image of their team. Ben Roethlisberger won a Super Bowl with Hall of Famer Jerome Bettis in his second pro season -- but he had plenty of maturing ahead of him. But within the locker room, there had been early confusion about what to make of Roethlisberger. He frequented the party and golf tournament circuit with veteran players and, Tollner theorizes, wanted the freedom enjoyed by the less recognizable. In hindsight, Tollner admits, being out late at night at a college bar scene was not healthy. Meanwhile, among teammates, Roethlisberger sometimes drew rolled eyes from those who tired of what they perceived as his aloofness and immaturity. Charlie Batch, Roethlisberger's former backup, said he and Roethlisberger had talked about his role in the locker room as far back as 2008, with Batch saying bluntly now: "He wasn't the best teammate." "He had so much success -- you're the savior," said Arizona Cardinals coach Bruce Arians, who joined the Steelers' staff in 2004, served as Roethlisberger's offensive coordinator from 2007 to 2011 and has remained close to him since leaving the team. 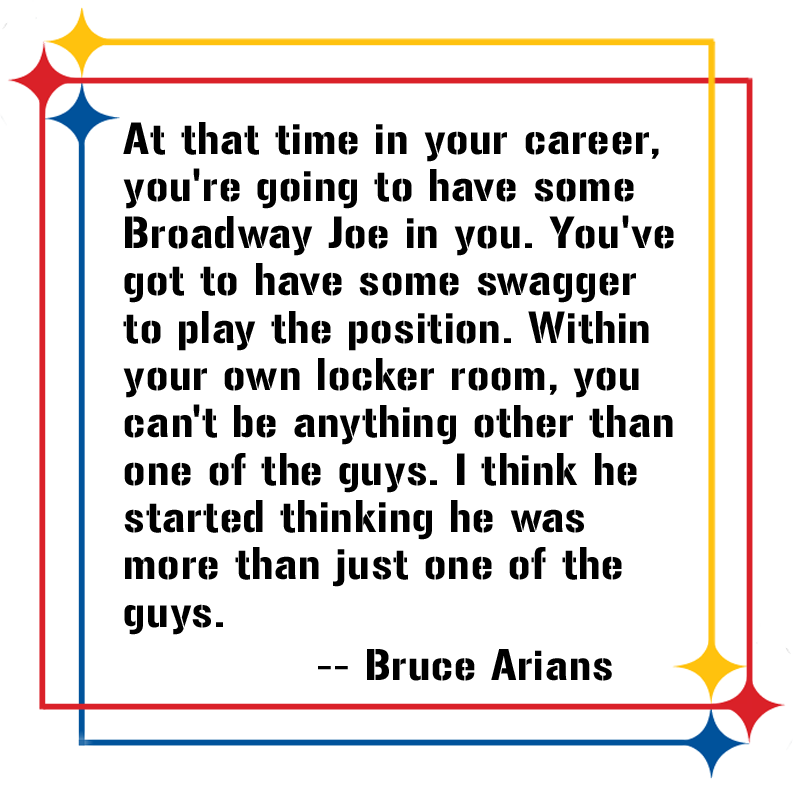 "At that time in your career, you're going to have some Broadway Joe in you. You've got to have some swagger to play the position. Within your own locker room, you can't be anything other than one of the guys. I think he started thinking he was more than just one of the guys." WHEN THE SEXUAL-ASSAULT ACCUSATION came in the spring of 2010 -- following a terrifying helmet-less motorcycle crash in 2006 and a 2009 civil lawsuit in Nevada that alleged Roethlisberger had sexually assaulted a woman there in 2008 (a case that was eventually settled in 2012) -- Roethlisberger became a cautionary tale of unbridled athletic entitlement. Despite the two Super Bowls the Steelers had already won with Roethlisberger, fans turned against him so dramatically, deluging Steelers offices with angry calls and emails, that team president Art Rooney II admitted at the time that he was concerned about whether Roethlisberger would be able to win them back. Rooney says now that the Steelers never gave up on Roethlisberger, despite speculation at the time that they were so upset they had contemplated trading him. There were many difficult moments, Rooney said, but the decision to keep Roethlisberger was rooted in the Steelers' belief in the strong family the quarterback was raised in, in the fact that there had been no red flags before he'd reached the NFL and in their conviction that Roethlisberger was sincere in his embarrassment. It was also, of course, a deeply pragmatic call. "No. 1, if he wasn't as talented as he was, the team would have cut him," Batch said, explaining one topic he and Roethlisberger discussed that spring. 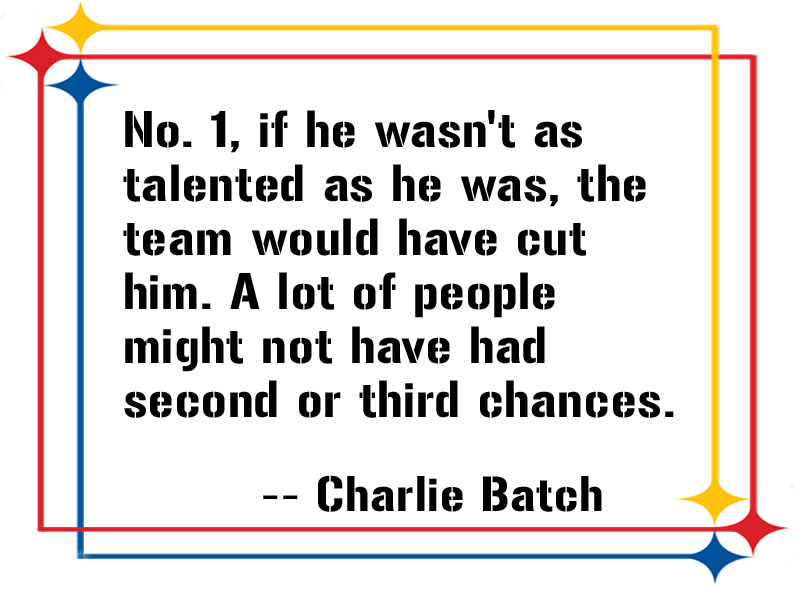 "A lot of people might not have had second or third chances." To the football world, it seemed obvious that having his career on the brink of ruin finally got Roethlisberger's attention. But in fact, it was the private conversations Roethlisberger was having during that period that resonated most painfully and powerfully with him. "For me, it was talking to my parents and them saying, 'For a while, we didn't recognize who you were anymore,' " Roethlisberger said. "When your dad or your mom says, 'We felt we couldn't even talk to you about things, you would get so defensive and get angry,' that breaks you down. One of my biggest fears growing up was to disappoint my parents. That's why I never wanted to do anything bad when I was a kid. Because I didn't want them to get disappointed. That's the wakeup call." 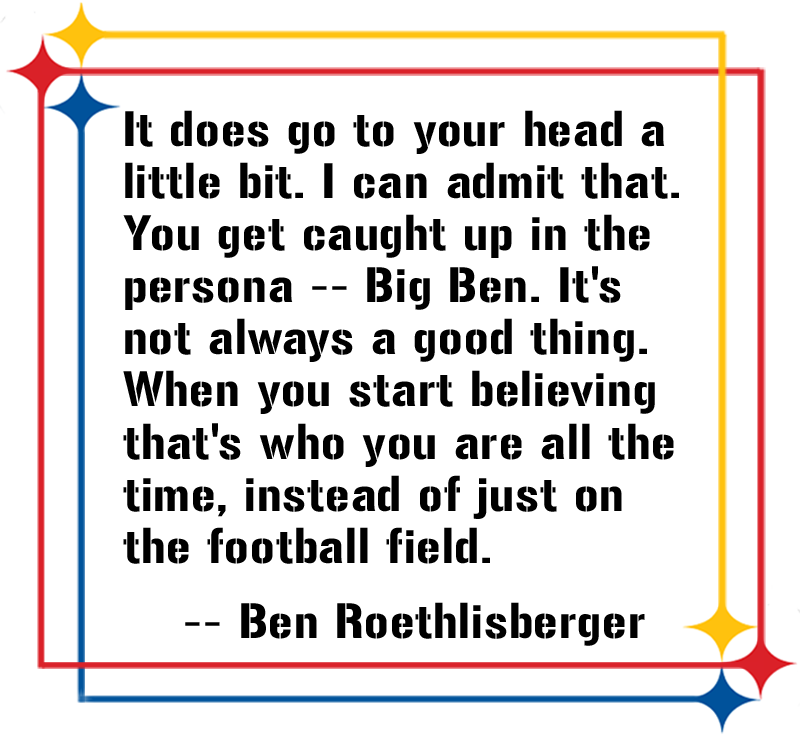 Roethlisberger talks matter-of-factly about his demeanor in the early part of his career. The phrase that several people around him use to describe the difference now is "comfortable in his skin." Roethlisberger never looks away from a reporter as he recounts even those excruciating conversations with his parents. For anyone who has been around the Steelers with any frequency during Roethlisberger's tenure, the change is obvious. He is friendly and open where once he had seemed cold and a bit obnoxious. "At his core, he was a good person," Rooney said. "We know his family. We know the kind of person he wanted to be. He was not a guy who didn't know what he wanted to be." Roethlisberger began the task of returning himself to what he said was the real him with almost no public comments, a calculated decision to not draw more attention to the situation. He chose not to appeal his suspension. Roethlisberger apologized to behind-the-scenes members of the Steelers organization and to reporters who had covered him. He met with his teammates individually. Tollner and Roethlisberger had a critical conversation in which Tollner told Roethlisberger he could lash out and fight back to try to win people over, or he could reflect on his life and try to never give anyone he encountered reason to say anything negative about him again. "It was one of those moments when life shakes you and says, 'Hey, you need to do things differently,' " Tollner said. "He listened." Roethlisberger and his wife, Ashley, have two children together: daughter Baylee (left) and son Benjamin Jr.
With the exception of community and charitable events, Roethlisberger slid largely out of public view, effectively making his world a lot smaller, Tollner said. He started seriously dating the woman -- Ashley -- who would become his wife. He avoided going to places where it is difficult to make everybody demanding his attention happy, so he mostly stays out of bars and clubs unless he is with the team. He moved his parents to the Pittsburgh area (Roethlisberger's sister works for the Pittsburgh Pirates). On the day that the Steelers had their first public practice of the 2010 training camp, Roethlisberger was anxious about how fans would receive him. Moments before the players were to leave the locker room for practice, receiver Hines Ward -- who had clashed with Roethlisberger when he thought the QB was overstepping his place in the locker room hierarchy and who had publicly suggested Roethlisberger owed teammates an explanation of his off-field travails -- told Roethlisberger he would walk with him down the long sloping sidewalk, past thousands of fans, to the practice field. It was a very overt benediction from a respected veteran, and after an overwhelmingly warm reception from fans, a relieved Roethlisberger stayed a half-hour after practice ended to sign autographs, winding up in stocking feet because he had given his shoes to kids in the crowd. During his suspension, Roethlisberger worked with quarterback coach George Whitfield, armed with daily scripts from Arians about what he was to work on. "The suspension hurt him personally more than anything -- in some ways, it was a 'Come to Jesus' moment, who am I?" Arians said. "But as a player, in that time off, he found a whole new respect for fundamentals." IT SEEMS REMARKABLE, in retrospect, that the Steelers went to the Super Bowl after such a significant distraction. But in the 12 regular-season games he started, Roethlisberger threw 17 touchdown passes against just five interceptions. In every season since then, Roethlisberger's completion percentage and touchdown totals have risen -- in 2014, he completed 67.1 percent of his passes for 4,952 yards (both career highs) and 32 touchdowns (tying his career best). The Steelers had the NFL's second-ranked offense. "I told [young running back] Le'Veon Bell when he got here: 'You don't realize this city is about defense, running the ball and winning and then the offense,' " Roethlisberger said, laughing. "That was the priority. I still think the city wants defense, but they also want to win. It is unbelievable how it has evolved and changed. You have to be able to evolve, and it's hard for defenses to stop." The addition of playmakers like Bell and receivers Antonio Brown, Markus Wheaton and Martavis Bryant has helped convince Roethlisberger that even when he has to get rid of the ball quickly, the Steelers now have the personnel to turn short plays into big ones. Todd Haley, the offensive coordinator who replaced Arians, says that Roethlisberger learning to use one of his defining on-field gifts with greater discretion is a critical reason for the offense's success. Roethlisberger has been sacked 419 times since entering the NFL in 2004 -- easily the most in the league over that span. "He's the best in the world at extending plays and making big plays," Haley said. "That's not a way you can live full-time as you get older. I've tried to get him to see the light on it. It's not third down in the fourth quarter and we're down by a touchdown. It's the first quarter and the game is tied -- it's alright to throw an incompletion and punt." At the start of training camp last year, Roethlisberger stood up in front of the offense and asked why, after all the years that the Steelers were about the Steel Curtain, it couldn't be the offense that led the team to championships. Roethlisberger's performance, in steering the Steelers back to the playoffs, made clear the offense's promise. Roethlisberger has hosted dinners for teammates and organized offseason workouts with his receivers. He takes young teammates aside to deliver pointers during practice, and he is now the veteran cheering on coaches and players when they try to fling a football into a garbage can during a light day of practice. It has all laid the groundwork for Roethlisberger to become, after ceding the role for the first part of his career, the most dominant figure on the team. "When I first got here, there was no reason to be rah-rah," said Roethlisberger, who is now the third oldest player on the roster. "You still have younger guys evolving. That's why I don't break down the team every day after practice. I watch them. Maybe when it's a big game or practice, but for me, it's about letting those guys grow." The rebuilding of the man and the renovation of the offense were rewarded this spring, when Roethlisberger received a new contract (worth up to $108 million) that almost certainly will allow him to play out the rest of his career with the Steelers. His wife and two children sat in the front row at the press conference. The Roethlisbergers are scouting local school districts where they will build a house that will continue to be their home even after Roethlisberger retires. In the meantime, Roethlisberger has a big lawn at his current home, and he tends it himself on his riding mower. In the end, Tollner said, Roethlisberger is inherently a homebody. Roethlisberger is now the third-oldest player on the Steelers' roster -- and the one-time wunderkind says he takes his role as elder statesman seriously. As the Steelers began another training camp this summer, it was time for Roethlisberger to deliver another message. At 33, Roethlisberger is younger than only James Harrison and Michael Vick among Steelers players, and there is a sense of urgency when he considers his age and his contract. He has those two Super Bowl rings, but they seem to be from another time for him and for the Steelers. When Roethlisberger stood in front of the offense this July, there was no need to wonder about its place -- or his -- with the Steelers. 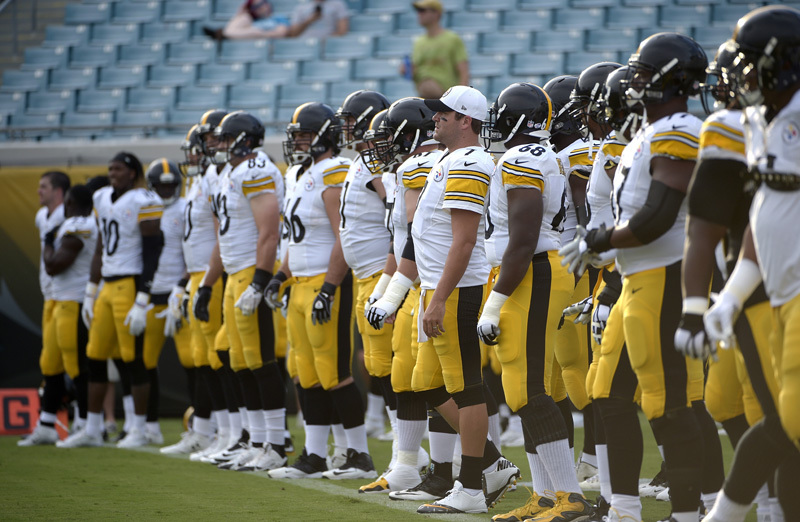 "The message this year was, it's not going to be handed to us," Roethlisberger said. "We saw the potential. We touched on what we could be. Don't get caught up if your numbers are not as good. We can still be better." The message had evolved. So, it seems, has the messenger. Judy Battista is a columnist for NFL Media. Follow her on Twitter @JudyBattista.